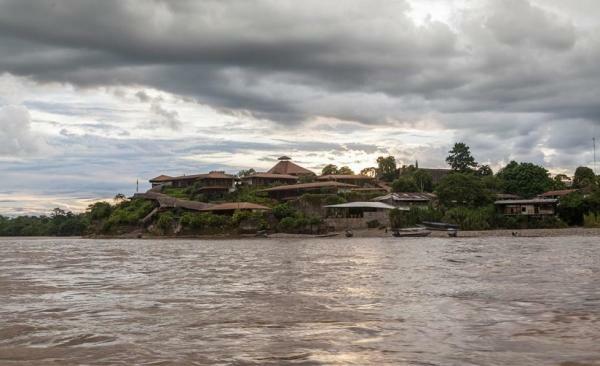 La Casa Del Suizo is a traquil Amazonian Refuge located on the shore of Ecuador's majestic Napo River and a stone's throw away from the eastern slopes of the Andes Mountains. 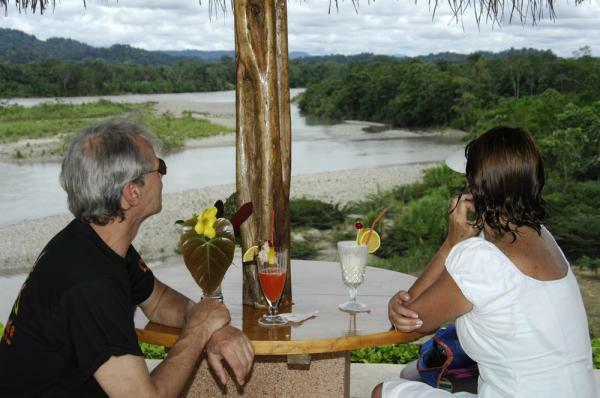 Perched comfortably above the riverbank and the small Quechua village of Ahuano, La Casa del Suizo overlooks vast expanses of the surrounding tropical rainforest environment and is a great place to begin an Amazon tour. 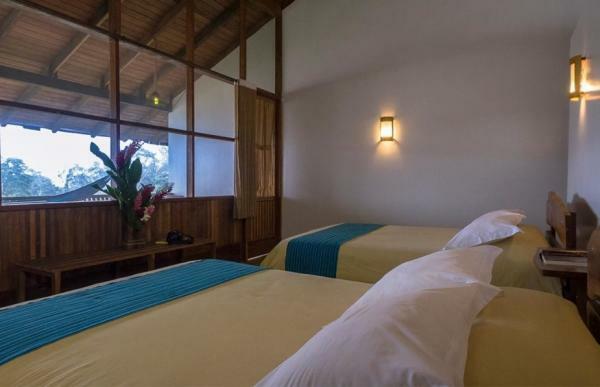 Each of the 75 modern, comfortable rooms offers 24-hour electricity, hot water, a refreshing ceiling fan and an exquisite view that may be peacefully absorbed from the privacy of one's own terrace. 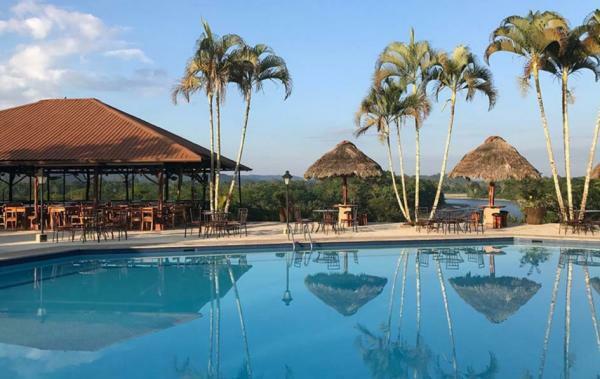 With a magnificent panorama of the Napo visitors may enjoy our swimming pool, outdoor dining area and pool bar, which offers an array of delicious tropical drinks. The hotel's dining rooms offer a wide variety of both Ecuadorian and international dishes, and our buffets cater to vegetarians. International telephone service is conveniently available in our reception area. 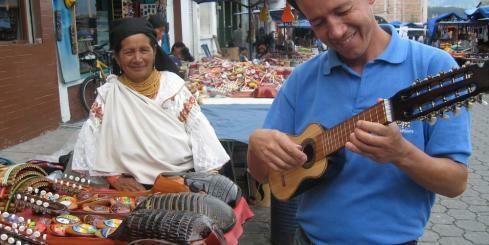 La Casa del Suizo has direct radio contact with Quito as well as permanent telephone communication. In case of a minor medical need, there is a medical center located in the town of Ahuano (Adjacent to Casa del Suizo) where guests may be treated. For emergencies, there is a well-equipped regional hospital in Tena, 25 km away from La Casa del Suizo. Drinks are not included in your package, and may be paid on the last night of your stay in cash, travelers checks or credit card. Please note that the minimum credit card charge is $20. The north route: The shortest route coming from Quito to La Casa del Suizo is the "North Route". 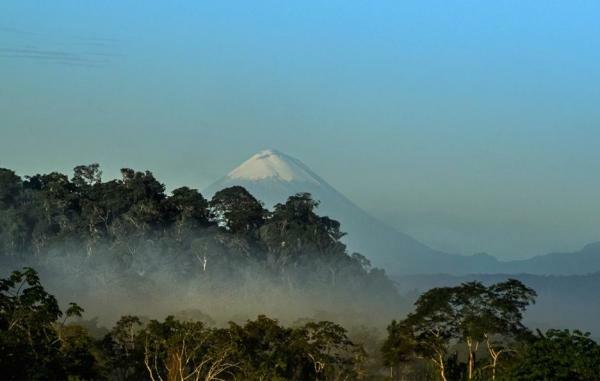 Over land, along a scenic stretch of road, which takes us out of the majestic Andes highlands, Quito – Papallacta – Baeza – Tena - Ahuano and down into the jungle. This route is 220 Km long, during the trip there are several opportunities to stop for photographs, overlooking lush green valleys and sparkling waterfalls. The south route: It is also by road taking the "South Route" Quito – Ambato – Banos – Puyo – Ahuano. If coming from Quito it is a 360 Km long, and it can take up to 7 hours. 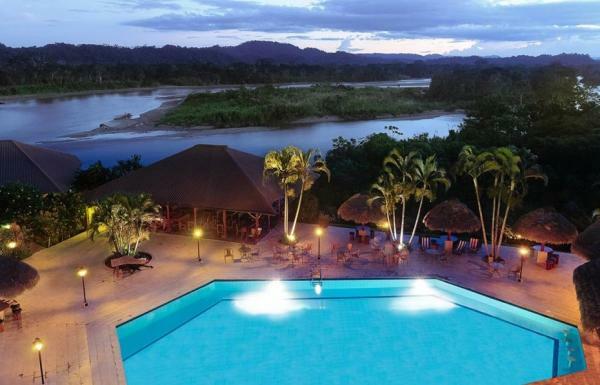 However, if coming from the south of Ecuador this would be the best option. 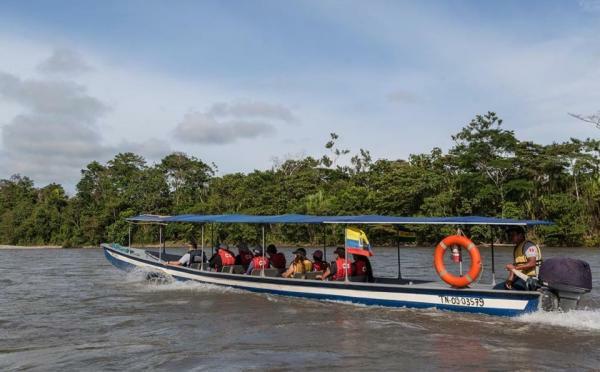 Be it the North or the South routes, our destination is Punta Ahuano, a tiny port town on the North bank of the Napo River where canoes await for a 20-minute ride downstream to la Casa del Suizo. 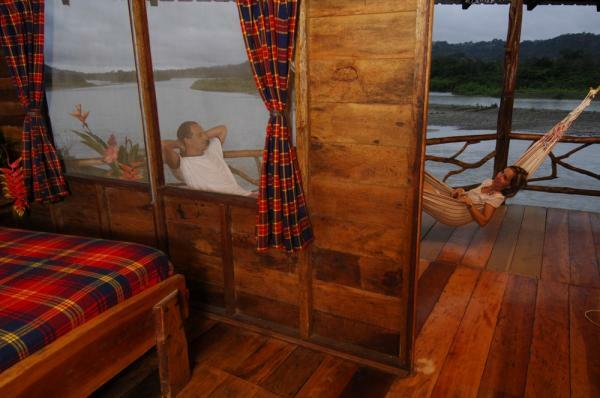 La Casa del Suizo is a tranquil Amazonian refuge located on the shore of Ecuador's majestic Napo River and a stone's throw away from the eastern slopes of the Andes Mountains. Perched comfortably above the riverbank and the small Quichua Indian village of Ahuano, La Casa del Suizo overlooks vast expanses of the surrounding tropical rainforest enviroment. Casa del Suizo was founded by Arnold Ammeter, otherwise known by his friends as “Beni.” Hailing from Interlaken, Switzerland, Beni arrived at Ahuano (in the Napo province) in 1985 with his two daughters – ages 14 and 12 – with a high level of interest in finding new horizons and starting a new life. 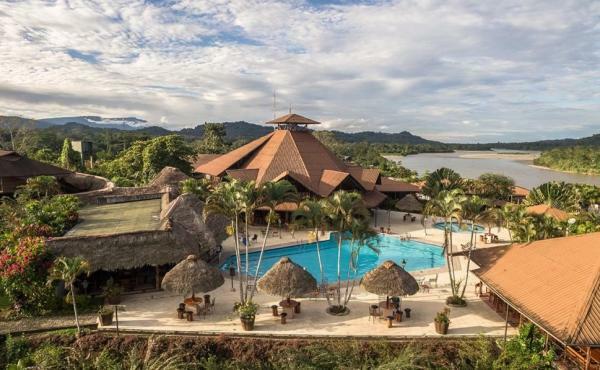 In time, Beni bought several pieces of land right on the Napo River in Punta Ahuano where he began a number of startups – a convenience store and the production of cacao, coffee and gold – while nurturing his dream of having a hotel one day. It happens that just beyond that exact spot of the Napo River where Beni chose to settle there was dangerous whirlpool that the locals preferred to avoid, and thus Beni’s newly established convenience store was in a crucial location that was capable of providing goods to the locals while freeing them from having to cross the whirlpool. As the business grew, so did Beni’s clientele; eventually leading him to do business with nearby towns like Misahualli and Tena. 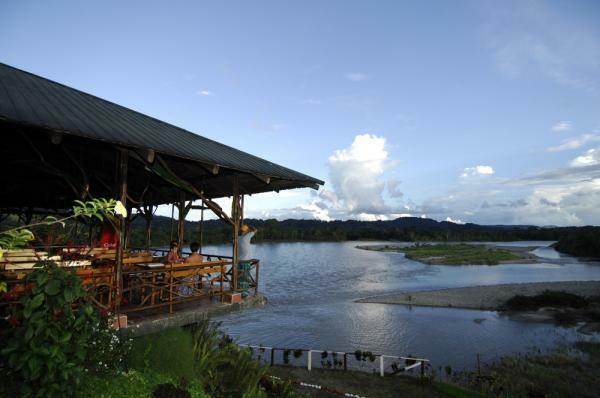 As a result of this, and with his influx of income, Beni’s dream finally came to fruition – the creation of his first hotel on the shores of the Napo River began. It started in 1986 with just three rooms located on the upper part of the convenience store itself, all of which shared a bathroom. During this time, transportation by land was quite limited and a lot of people traveled by boat along the area. 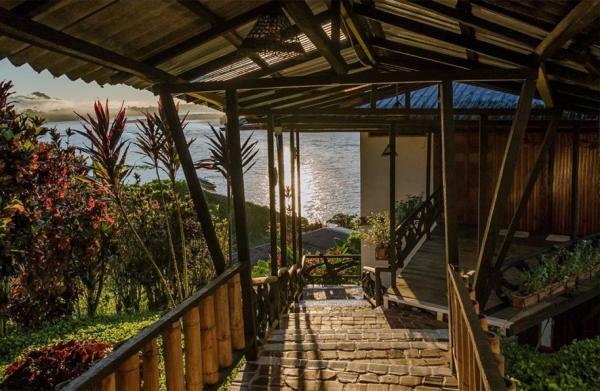 Those headed for Misahualli to Francisco de Orellana (Coca), or vice-versa, often stopped by la “Casa de Beni” (or as it later came to be known: Casa del Suizo) to spend the night – a convenience that helped many of them avoid having to the deal with the dreaded whirlpool after sunset. Beni himself would cook for his guests while his daughters, who studied in Ahuano, helped him out after school. In 1987, a powerful earthquake shook the region and a number of the roads were destroyed and closed. Beni took the initiative to buy a fleet of large canoes and began offering transport service for people in and around the affected areas. He also helped oil companies mobilize their employees and equipment to and from the jungle during this time. Thanks to Beni’s decision to do so, his hotel business continued to grow well into the 90’s, by which point he had 30 rooms. In 1994, he finished the construction of the hotel which by then included 75 rooms, 1 pool and a large restaurant. La Casa del Suizo is proud to be one of the biggest employers in the entire province, generating over 80 on-site jobs and 40 off-site jobs. 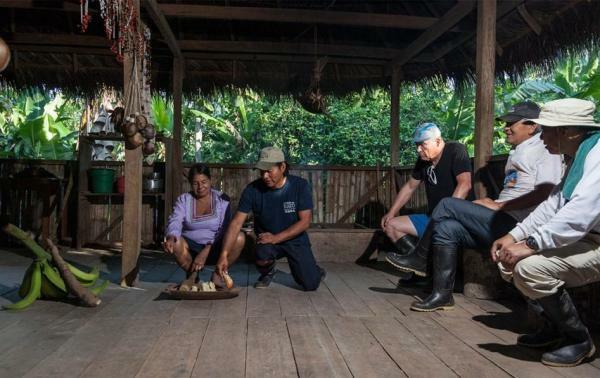 At La Casa del Suizo, all the excursions are led by a guide that is a native of the area and has plenty of knowledge and experience with the Amazonian plants, along with their medicinal and practical use. 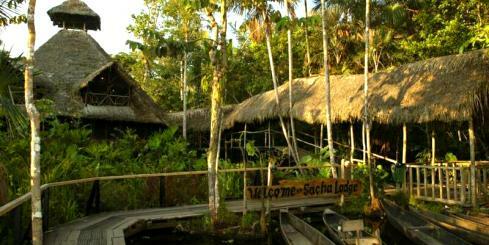 After a delicious and early morning breakfast you are welcome to choose from an array of activities offered. A short journey downriver by canoe will take you towards the home of a native Quichua family, currently living under the influential traditions of their ancestors while separated for the small town of Ahuano. Once there, you will get to observe how their typical and alcoholic drink known as "chicha" is prepared, along with a chance to drink it. 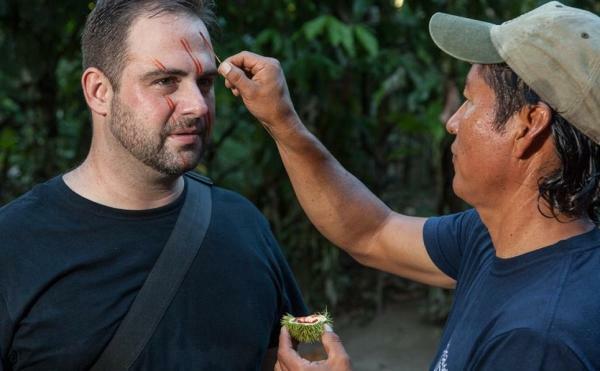 In addition, you will get a hands on experience with a blowgun - an important weapon used by the people of the jungle in hunting food. You will soon find out that it is not easy to aim! After a 30-minute hike, you will return to the town and visit a ceramics workshop. At the workshop you will observe a Quichua native as she shows you how the ceramics and pottery are manually made - all of them crafted exclusively with materials from the area. You will also make another brief stop at a different workshop where carpenters will demonstrate how they can transform a piece of wood into a beautiful bird of the Amazon. 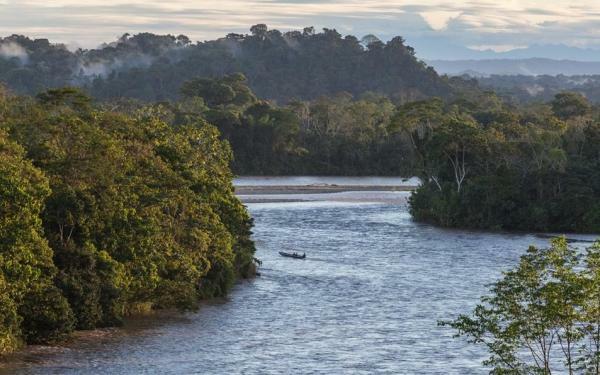 A 15-minute journey upriver in a canoe takes you to Casa del Suizo's private reserve, with a primary forest that is a must-see. 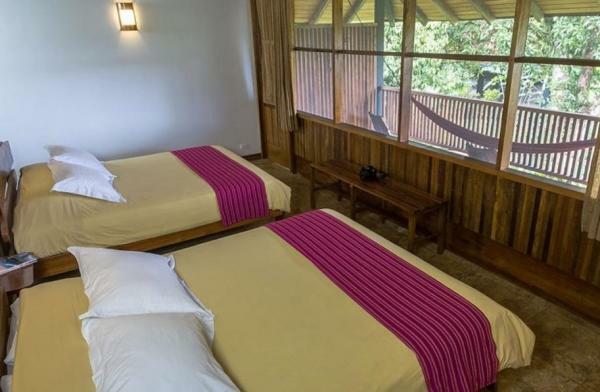 Once there, you will head about 100-meters into the reserve to briefly rest at a small cabin right before you begin your hike through the jungle. There are a number of walks (with varying levels of difficulty) that can last anywhere from an hour and a half all the way up to 4 hours depending on what you are feeling. 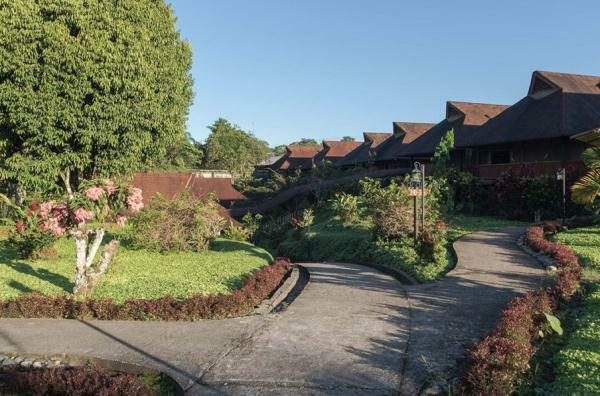 The trek through the thick and humid jungle is incredibly unique, putting you on a journey that will have you crossing picturesque streams and muddy paths all under the forgiving shade of overhanging plants and trees. 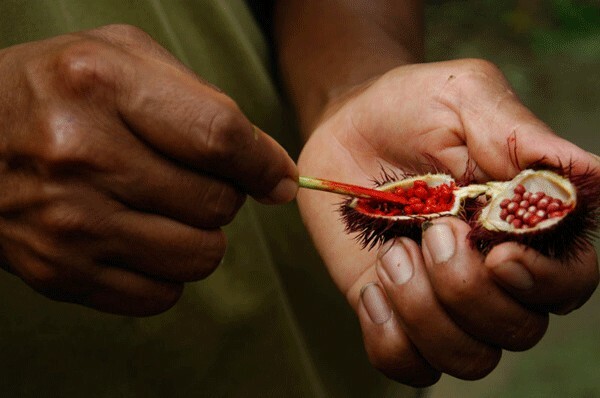 Throughout this trek, the local guide - whose knowledge about the use of plants as medicine may astound you - will introduce you to all the hidden secrets and wonders of the jungle. At the end of the walk there will be a canoe waiting for you at the docks, at which point you will begin your journey back to Casa del Suizo. 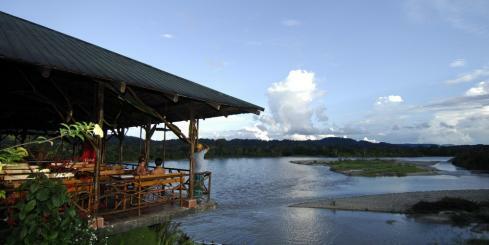 A 20 minute canoe ride takes you to Cosano, a private property containing primary forest along the Arajuno River. From here, you can head out on adventurous hikes that vary in length and difficulty. 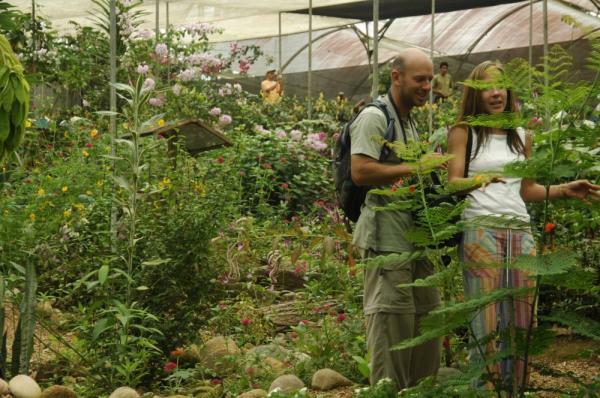 Just 15 minutes away from the trail leading up to Casa del Suizo is the butterfly farm. 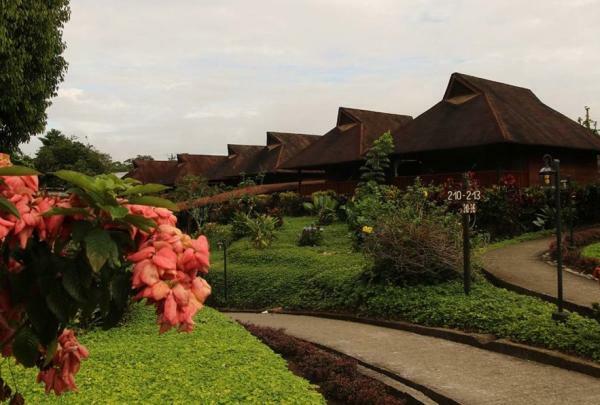 Set up as a living exhibition of the local butterflies, the farm currently houses and serves as the mating ground for nearly 20 species from the surrounding areas. You will be able to observe and examine how these beautiful creatures are fed, raised and undergo metamorphosis. In addition, you will have the chance to enter the "winged room" where hundreds of butterflies, of various colors, fly about from corner to corner. There is an admission cost of $4. 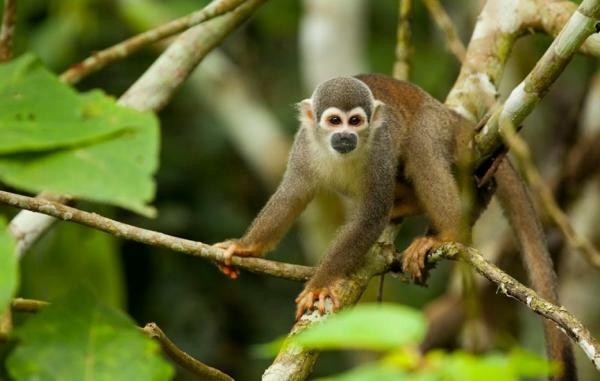 Zip through and across the lungs of this earth with the canopy adventure tour! Find yourself whizzing under the foliage and over the jungle floor in no time with the help and supervision of the experienced guides. At Casa del Suizo, they utilize only the best and most tested materials throughout their zip-line infrastructure, which creates an entirely safe experience for zip-liners of practically all ages and sizes. In addition, they use their unique "Edelrid Smart Belay" safety system to keep any and all users from accidentally unclipping themselves from the line. 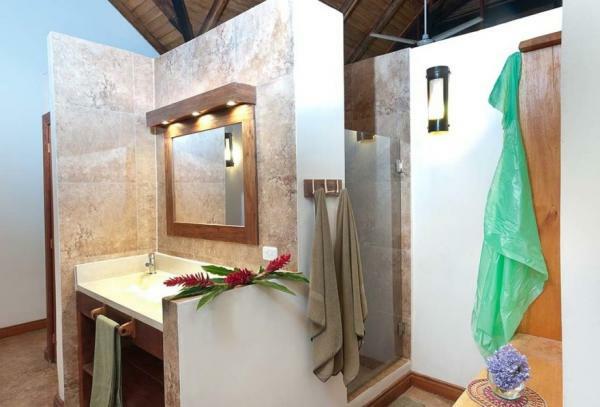 Take in the fresh air when you zip through the jungle here at Casa del Suizo. 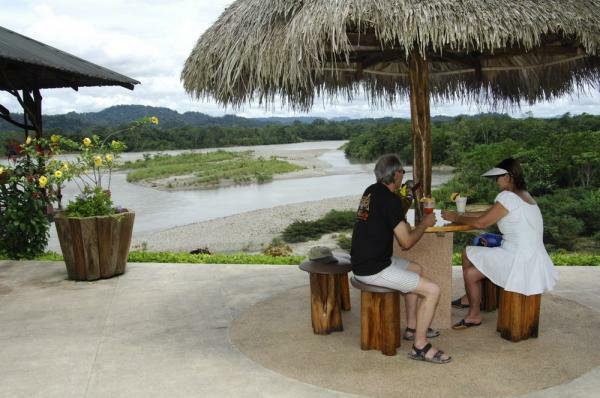 Casa del Suizo has kayaks that are readily available to you, along with kayaking adventure-tours that last a half-day or a full-day and involve class-one or class-two rivers. 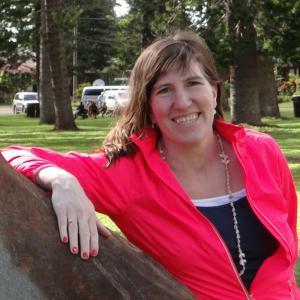 These programs are open to any person over the age of 12. It is important to note that these activities are not included in your daily, scheduled programs (for all-inclusive packages) and has an additional cost. It is also recommended that you reserve such a program ahead of time. 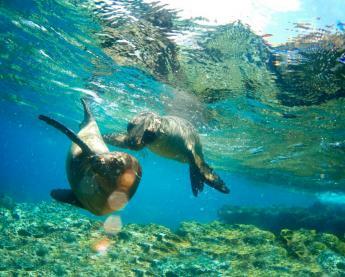 Behind the shores of one of the beaches along the River Arajuno is the famous animal refuge known as AmaZoonico. 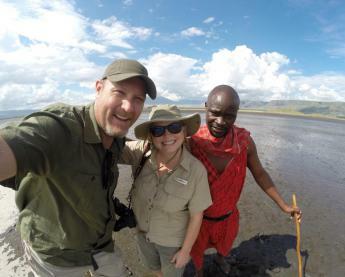 This refuge was founded for the purpose of protecting and taking care of the native and wild animals of the area that have either been injured, mistreated or been confiscated and handed over because they were being smuggled. 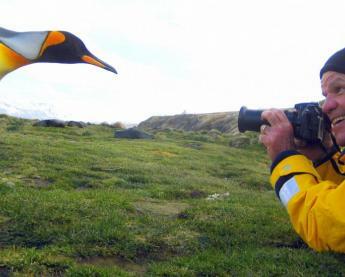 This is a great opportunity to observed how it is exactly that these creatures live in their natural habitat, something which is rather hard to do given how elusive these creatures are in the wild.